"The Merzbau is the construction of an interior from sculptural forms and colours. 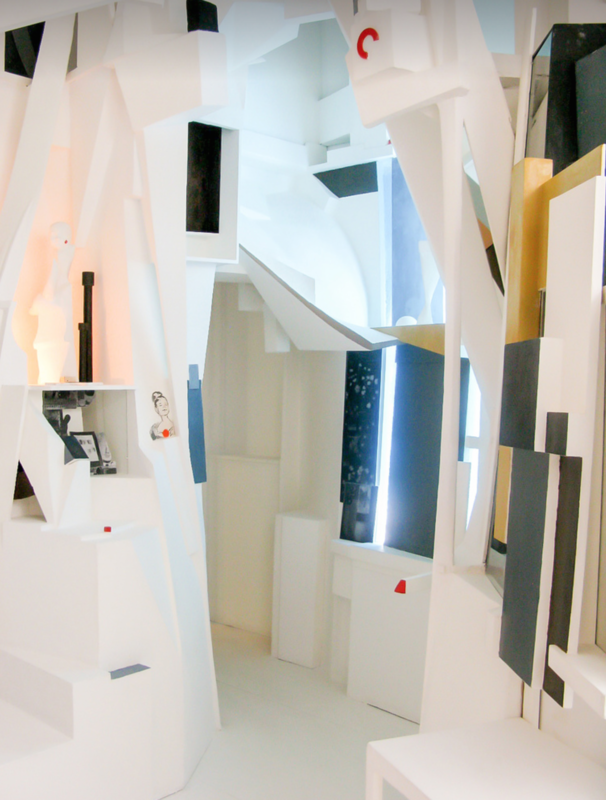 In the glazed grottos are Merz compositions arranged as a cubic volume and which blend with the white cubic forms to form an interior. 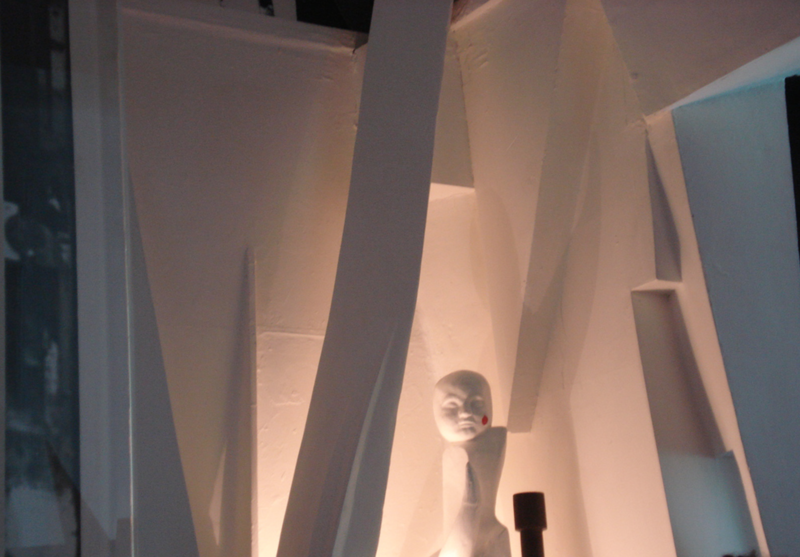 Each part of the interior serves as an intermediary element to its neighbouring part [...] sometimes I have taken a form from nature, but more often I have constructed the form as the function of different lines, parallel or crossing. In this way I have discovered the most important of my forms; the half-spiral." 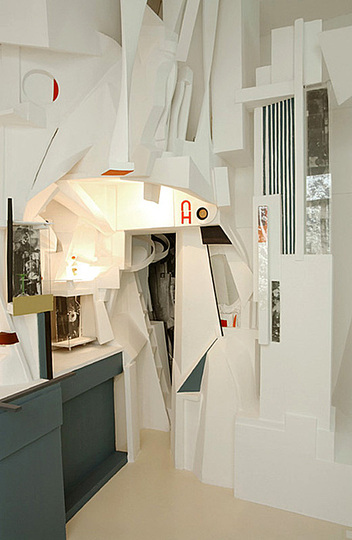 Kurt Schwitters began his Merzbau in his parent´s home in Hannover in 1923. 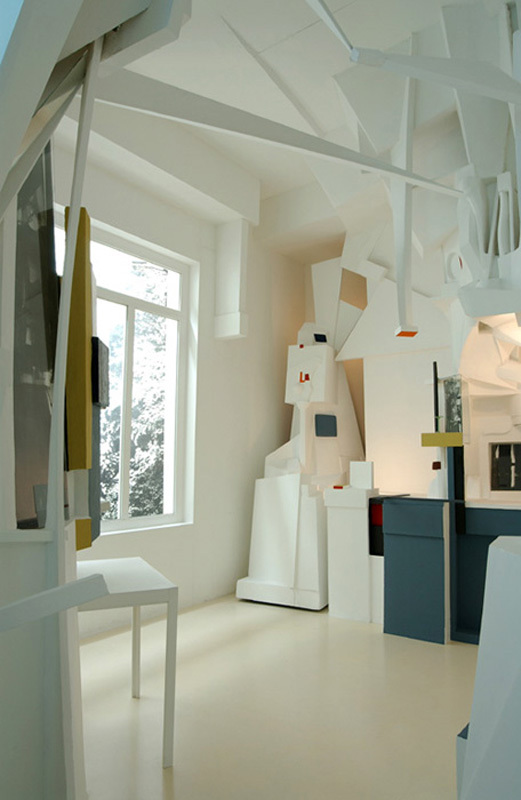 It began as an abstract plaster sculpture with apertures dedicated to his dadaist and constructivist friends and containing objects commemorating them: Mondrian, Gabo, Arp, Lissitzky, Malevich, Richter, Mies van der Rohe, and Van Doesburg. 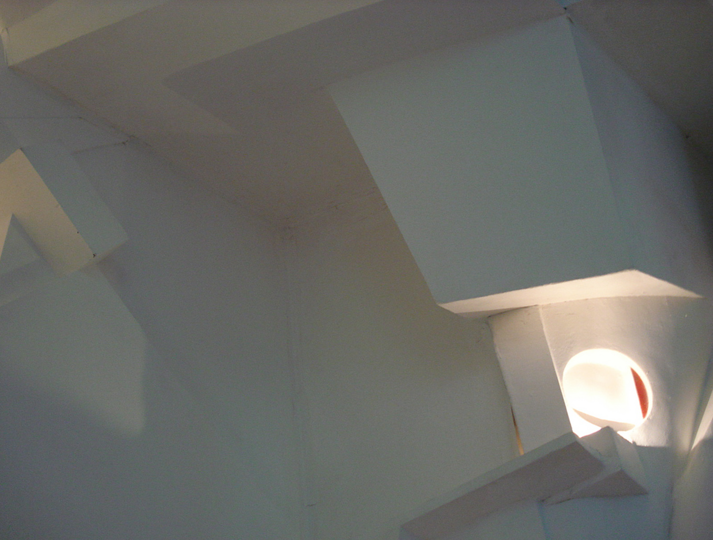 The walls and ceiling were covered with a diversity of three – dimensional shapes and the room itself was crowded with materials and objects – or “spoils and relics”. 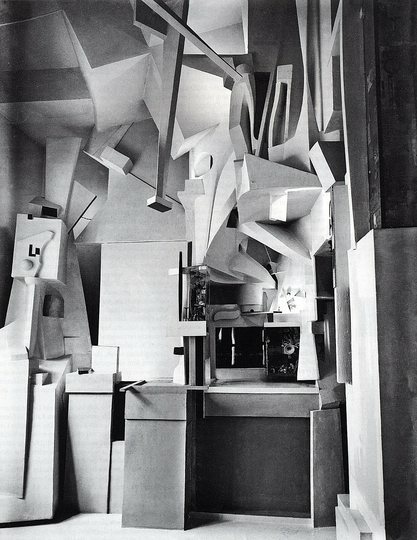 The Merzbau grew throughout the 1920’s with successive accretions of every kind of material until it filled the room. From here it spread to a second room, to an adjacent balcony, to the space under the balcony and to one or two rooms in the attic. Having been called a "degenerate artist" by the Nazis and being an outspoken critic of their activities, he fled Germany in early 1937, nearly escaping arrest by the Gestapo. Arriving in Norway, he began work on a new Merzbau in the garden of the apartment he rented in Lysaker, near Oslo that he called the Haus am Bakken, (House on the Slope). 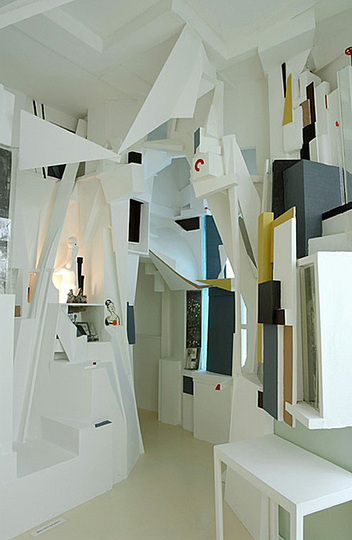 This work no longer exists, and virtually all that remains are some plans of the exterior drawn up by Ernst Schwitters. There are no known visual records of its interior, though according to Ernst Schwitters its structure was very similar to that of the Hannover Merzbau. 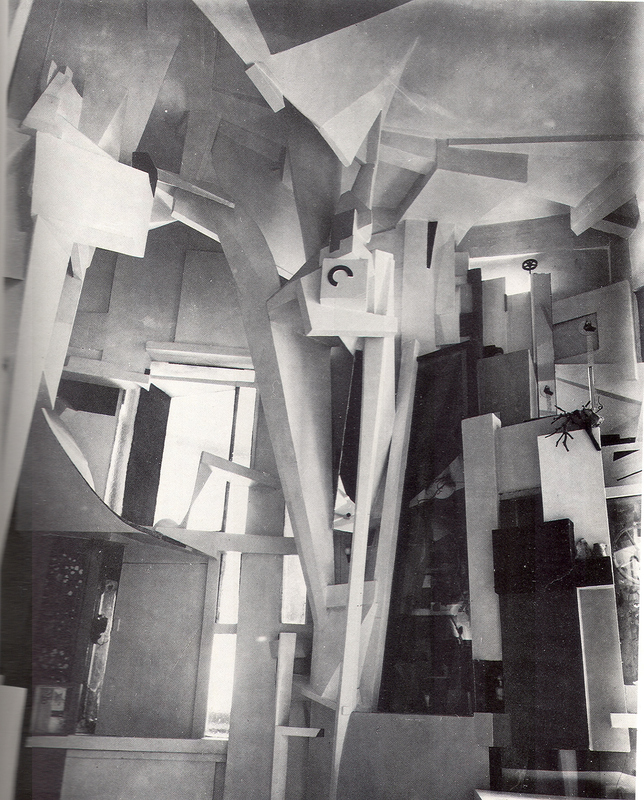 Schwitters began to make plans for the new Merzbau around July 1937, and started work on the exterior in earnest in the autumn of that year. As there was so little interest in contemporary art in Norway, his idea was to make a portable Merzbau that could eventually be moved to a location where it would be accessible to a more interested public. The sketches by his son Ernst were made on tracing paper and prepared for the local Planning Department in Oslo in early 1938. 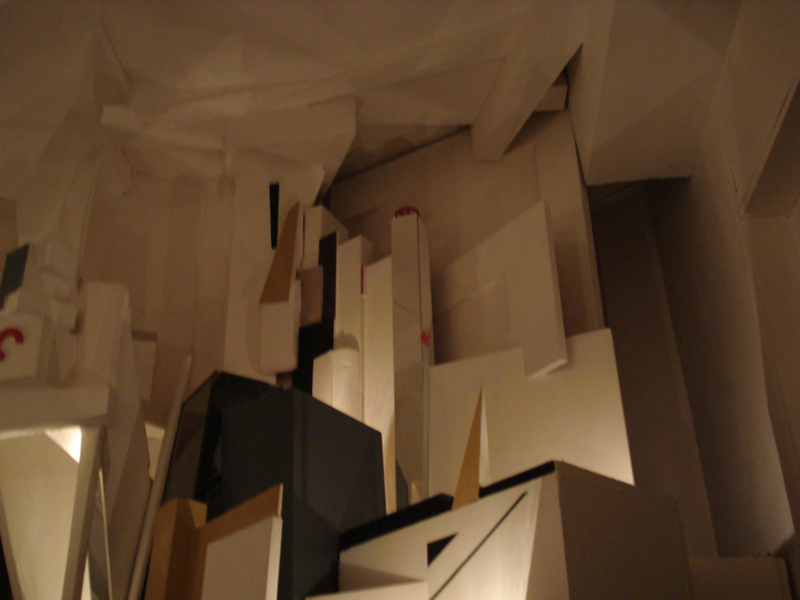 The building department first demanded he tear the Merzbau down, then grudgingly granted him official planning permission, then withdrew it once more. 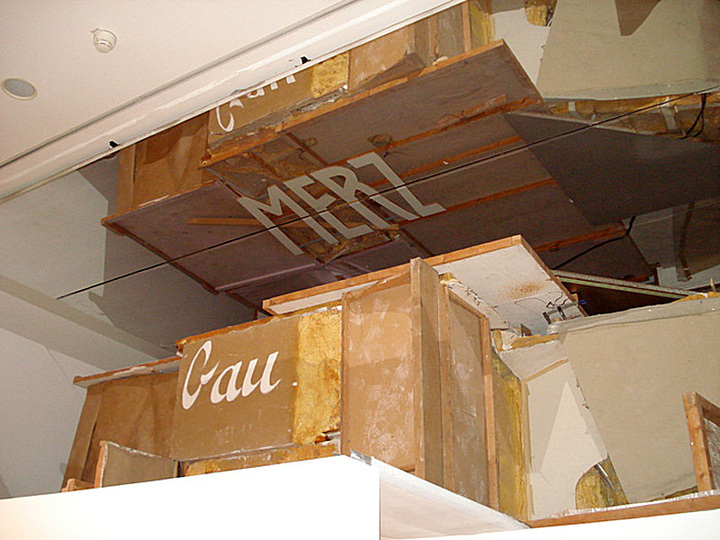 Merzbau II survived, however, and by May 1938 Schwitters had started on the interior. 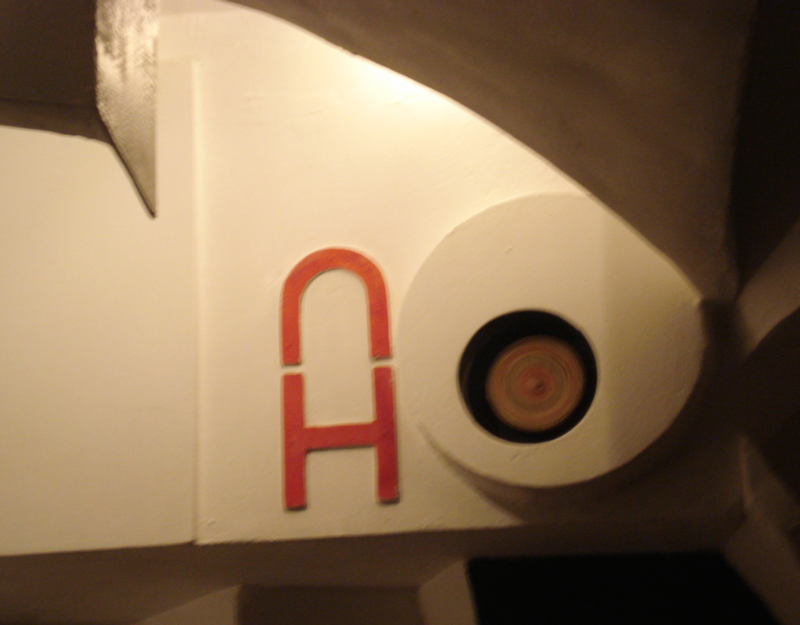 He worked intermittently on the upper and lower room of what had become a combined studio/Merzbau until 1939/1940, and it was almost completed when the Nazi´s invaded Norway in 1940. After a perilous flight to the far north, he left Norway for Britain in June 1940. The Lysaker Merzbau was destroyed by fire in 1951. After the war Schwitters settled close to London and then in Ambleside in the Lake District. In 1945 he began his third and final Merzbau. It is the only one still existing. 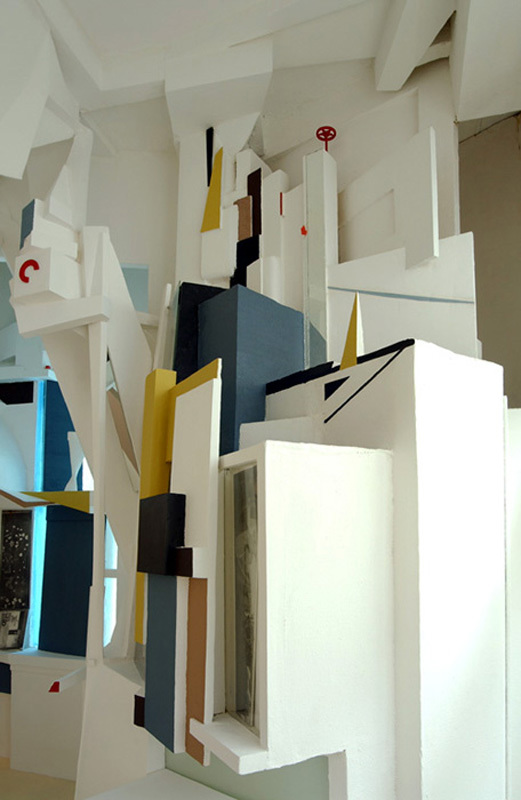 Schwitters´ Hannover and Norway constructions were destroyed. 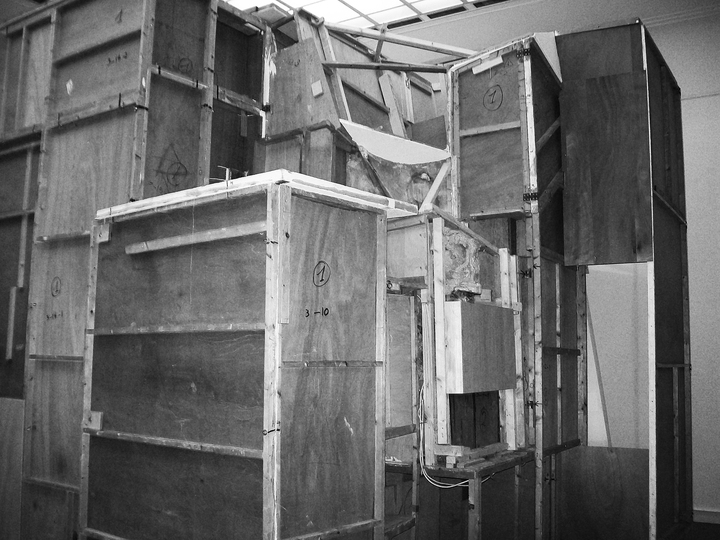 When he heard of the bombing of his Merzbau while he was in exile, he was devastated at the loss of what he called his ´life´s work´ and ´a new domain in art´. ´For what did I actually live?´ he wrote sadly; ´I don´t know.´ Even during exile in England, he never gave up his dream of completing another Merzbau to leave to posterity. The concept of a new Merzbau remained a central concern for Schwitters for a quarter of a century - that is, from about 1923 almost to the day he died - and he returned to this idea again and again, in Nazi Germany and later in the painfully difficult personal and political circumstances of his years of exile as a poverty-stricken artist in Norway and England. 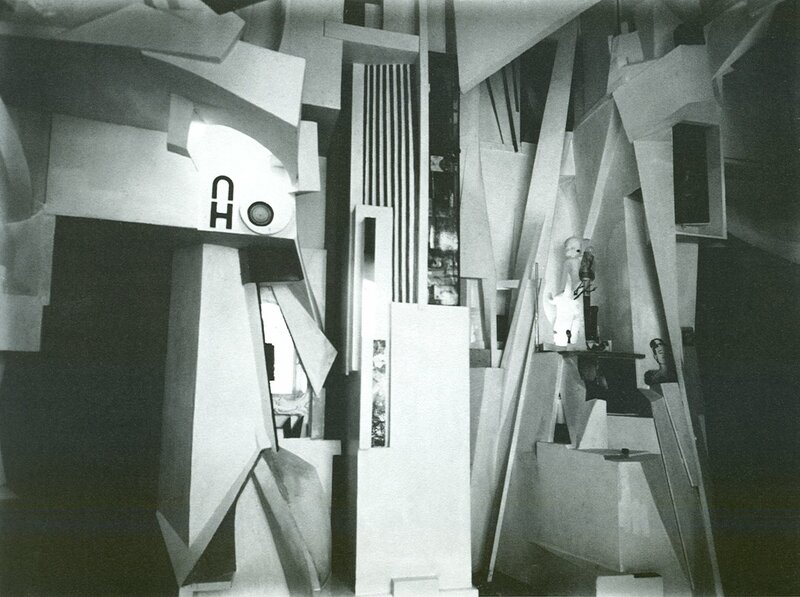 In 1983 theatre designer Peter Bissegger was commissioned to construct a full scale architectural replica of the Hanover Merzbau on the basis of three wide-angle photographs of the original dating from 1933. 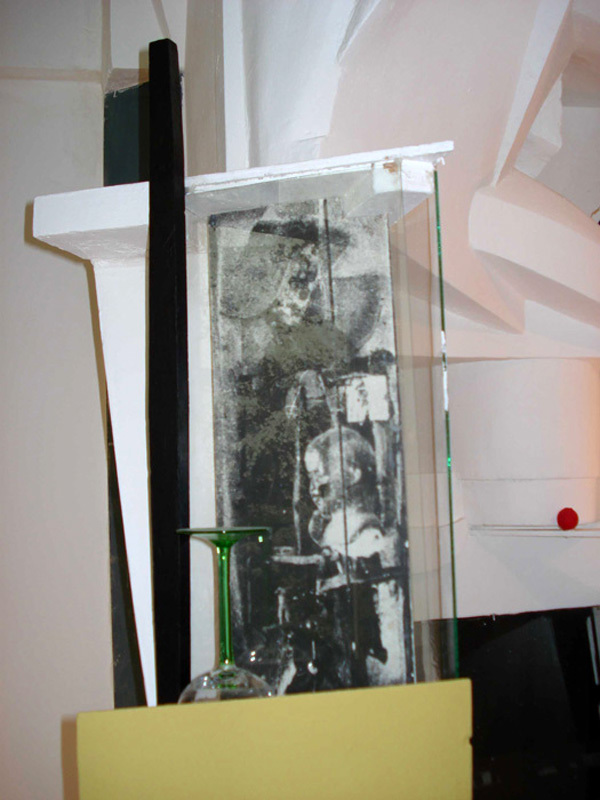 He was also aided by the recollections of Schwitters´ son Ernst. 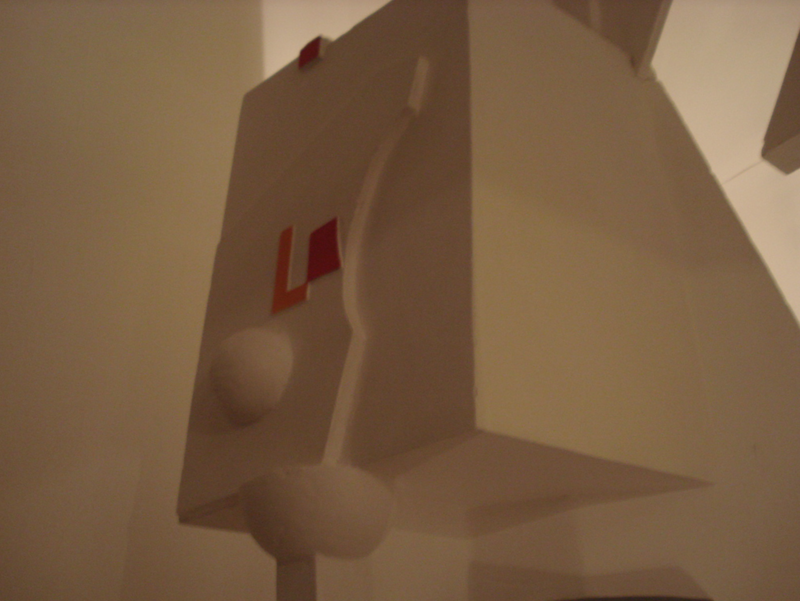 A second version was made for the Dada and Constructivism exhibition (1988-89) at Annely Juda Fine Art in London.